Before running in Visual Studio change the project output type from Windows Application to Console Application. Below is sample Program.cs code to run interactively in Visual Studio. // Keep the console alive for a few seconds to allow the user to see the message. In some cases I have setup caching on the website for items such as menus, header, footer, etc. However, when there is a CMS in place on the site and a user changes any of that relevant content there needs to be a way to reset the web cache. One easy way is to force the IIS web site to restart by making a benign change in the web.config file, which will automatically force the restart. Below is a sample version of code to do this, where I update an otherwise unused entry in the web.config that just indicates the last date/time of restart request by the user. In the case of an MVC application I put this into a controller with some specific route provided to the CMS users so they can navigate to that route after making CMS changes that need to be updated in the cache. As a side note, using this method will require granting write access to the web.config file for the IIS application pool user (by default "IIS AppPool\WebSiteName" user). I was using Piranha CMS with the out-of-the-box implementation in conjunction with an MVC Bootstrap HTML/CSS template. This was working great with the exception of certain tags (specifically in my case the <i> tag used in conjunction with FontAwesome) would get removed. This is because by default the TinyMCE html editor that Piranha CMS uses will only retain the configured allowable tags. I fixed this issue by adding my <i> tag to the configuration of allowable tags using the "extended_valid_elements" configuration setting of TinyMCE. This setting adds additional allowed tags/attributes in the TinyMCE editor in addition to the default allowed tags/attributes. "autoresize autolink code hr paste piranhaimage link"
Since the presence of a NuGet.targets file determines whether NuGet will continue to use the MSBuild-Integrated approach, this file must be removed. Also, as the .nuget\NuGet.exe file is not used by Automatic Package Restore, it likewise can be removed. By default, the NuGet.Config file instructs NuGet to bypass adding package binaries to source control. Automatic Package Restore will honour this as long as you leave this file in place. Note that NuGet.Config only has an effect when using Visual Studio to integrate with Team Foundation Server (TFS). In addition to these files, NuGet modifies the project files in the solution to reference the NuGet.targets file so it can participate in the build process. When migrating to Automatic Package Restore, these references must also be removed. 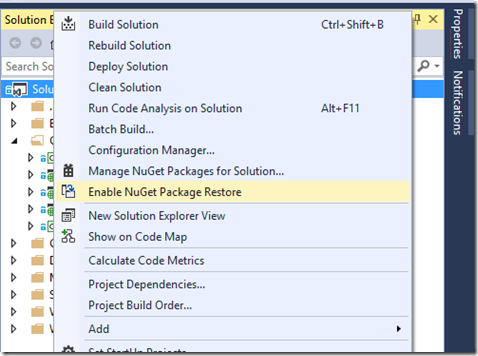 Remove the NuGet.exe and NuGet.targets files from the solution's .nuget folder. Make sure the files themselves are also removed from the solution workspace. 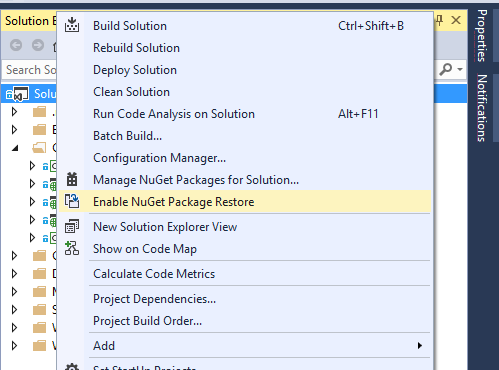 Retain the NuGet.Config file to continue to bypass adding packages to source control. Once you have made the above listed changes, you are good to check in the changes. I created a new MVC 5 web application with the "Individual User Account" option that configures the ASP.Net Identity model. By default this uses Entity Framework Code First model with a local file system database created in the local App_Data folder. I tried moving this to an actual SQL Server database location by creating the five dbo.aspnet_... tables and changing the web.config to point to the new location. However, in doing so I received the error below. Turns out to solve this I just needed to change the connection string in the web.config from the Entity Framework style to the basic style (see old vs. new connection strings below). Unable to load the specified metadata resource. Exception Details: System.Data.Entity.Core.MetadataException: Unable to load the specified metadata resource. Create the following object and bind it in the Global.asax as shown below. From the point of view of REST, a “real” Web service is a service designed to embrace the “Web” from the ground up. The Web has become the most successful distributed computing platform ever developed, thanks to years of investment and widespread usage. The Web platform includes concepts that you’re probably already familiar with like URIs, HTTP, and common data formats like XML, RSS/ATOM, and JSON. Ultimately, services that embrace these core concepts will immediately derive the valuable benefits they provide. REST defines an architectural style based on a set of constraints for building things the “Web” way. REST is not tied to any particular technology or platform – it’s simply a way to design things to work like the Web. People often refer to services that follow this philosophy as“RESTful services.” In this whitepaper, we’ll cover the fundamental REST design principles and show you how to build RESTful services with Windows Communication Foundation (WCF), the WCF REST Starter Kit, and ADO.NET Data Services. Here is a good article on setting up Visual Studio 2012 to allow development of Sharepoint 2013 applications. This approach to fix the issue with using external assemblies (i.e. assemblies not in the project folder structure). In this example the project references the "Encompass" assemblies from the "C:\Program Files (x86)\Encompass" folder. I wanted to use the program file reference so it’s easy to upgrade SDK; however, Visual Studio Project always have relative paths which doesn’t get resolved in TFS Build. To resolve this I have add new registry key for the Encompass folder path on the TFS build server so that it looks into this location when it compiles any project. Now I don’t need to change the project file. Add new key (in this case "Encompass") and then update the "(default)" string value to be the path to the assemblies (in this case "C:\Program Files (x86)\Encompass"). This SQL script will create a new ASP.Net user account using an existing user account as the basis. The new user account will have the same password and roles as the existing user account. Also included at the end of the main script is a script to change a user account password to a known defualt (e.g. Password1234). Below is illustration of setting the maximum file upload size to 150MB in IIS7. It requires two separate settings, one specifically for ASP.Net and the other specifically for IIS (as outlined below). This section applies to the maximum allowed file size that ASP.Net will allow. The value is specified in KBytes. This section applies to the maximum length of content that IIS will allow. The value is specified in Bytes. Below is an example of command program to compile an ASP.Net file system web using .Net framework v4 (the rem comment lines show the value for compiling as v2 as well).